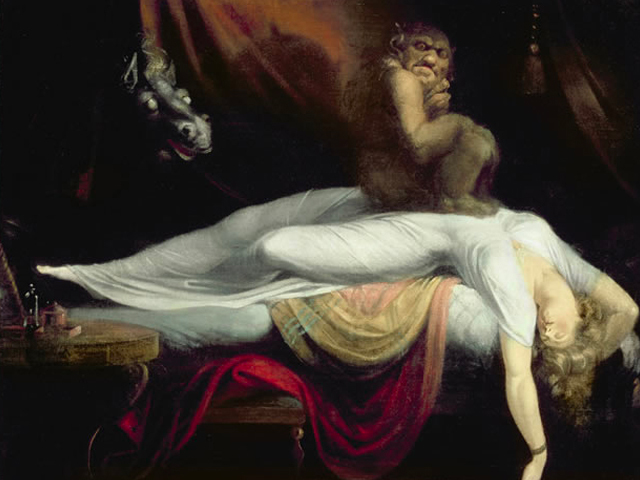 In the classical mythological tale called The Aeneid, the hero Aeneas descends into the underworld and encounters several demons, one of whom is the demon called Sleep. In the story of The Wizard of Oz, Dorothy and her companions are thwarted on their journey to Emerald City by the Wicked Witch of the West, her weapon of choice being a spell of sleep induced by a field of opium poppies. And in the book by Michael Ende, The Neverending Story, Atreyu and his horse are almost overcome in the Swamp of Sadness by a death-like sleep as their home — the dreamworld of Fantasia — is being swallowed up by a pernicious and mysterious force called The Nothing. The technical term for this perennial descent into the underworld is Katabasis, the coming back from which is termed Anabasis. As you've probably guessed, these mythological themes are perfect metaphors for the act of Conscious Sleep and it's nemesis, unconsciousness. The act of falling asleep and waking up consciously is a death/rebirth process in which the oneironaut plays the hero/heroine. The process of becoming a Veiler is the enactment of our personal myth and, like all myths, we can expect to encounter forces and characters both familiar and strange. We'll encounter guides and trials, adventures and monsters, challenges and the magic to overcome them. And it all begins with our acceptance of the Hero's Call, followed by the famed descent into the underworld. In this underworld of our subconscious and collective unconscious minds we'll encounter angels and demons alike. We'll encounter the hopes and fears, not only of our own psyche and the egregore of our particular culture, but of consciousness as such. It's important to understand that, just as Dorothy Gale with her Ruby slippers, Atreyu with his Auryn talisman, or Merlin with his magical staff, our totem (power-object) during this descent into the underworld of sleep is CONSCIOUSNESS! For a truly successful Katabasis/Anabasis we need to be able to withstand the intoxicating spell of what I call the Sleep Serpent. When it comes to getting a healthy night's sleep, the sleep serpent is your best friend, but in your quest to become a Veiler that snake is your arch-enemy! You wake up an hour later drooling on your meditation cushion because you nodded off again! Some hero you turned out to be, aye? If I become proficient at bypassing unconscious sleep, won't I be inadvertently training myself to become an insomniac? Practice In the Morning and/or Afternoon! Gradually Practice on Increasing Degrees of Reclining Posture! Allow for Time to Develop the Proper Neuronet for Conscious Sleep! This is a no-brainer. One of the biggest reasons why most meditation practices are practiced in a sitting position is that it promotes mental alertness. The human nervous system has been trained for millennia to remain alert while the body is erect, to relax while reclining, and to sleep while lying down. As always, we want to ride the wave of these evolutionary developments and use them to our advantage whenever we can. You can think of it as the Tao of Conscious Sleep. This works along the same lines as the above recommendation. In my own system of Conscious Sleep (Subliminal Cognition Training™), I always tell beginner-level students who desire to experience Lucid Dreaming that they should first establish a Circadian Rhythm, then purchase an alarm with adjustable volume settings, set their alarm for 4:00am, and then (without getting out of bed) begin a Lucid Dreaming technique. This approach yields such consistent results that it has become a staple of most systems of teaching Lucid Dreaming. The reason for it's remarkable success is that this method utilizes the natural rhythm of human biochemistry. If you practice only when you go to bed at night then you're actually swimming against the tide of nature, which includes your own biorhythms. At night, you're probably pretty tired from the day! Add to this the fact that the pineal gland in your brain is beginning to flood your body with the sleep hormone called melatonin, a process which starts as soon as the sun begins to descend over the horizon. With this mind one can see how difficult and counterproductive it can often be to practice Conscious Sleep at bedtime. Of course, this doesn't mean that one shouldn't practice at this time, but it shouldn't be the only time one practices, especially if you're expecting to see quick results. This is the method I used to train myself to remain alert during my own frequent descent into the underworld and is one of the unique contributions of SCT™ to the contemporary study of Conscious Sleep. Considering what we've discussed thus far it should be obvious how and why this tip works. As we've seen, the brain has been conditioned for millennia to be alert while sitting up, to relax while reclining, and to fall asleep while lying down. What we're trying to do is gradually retrain the bodymind to remain alert in all three of these basic postures (neuroplasticity). This is nothing new, and the Yoga traditions have known this for thousands of years (Asana). Like any newly acquired skill, Conscious Sleep requires a specific anatomy in order to become a stable and consistent trait of your experience. Whether learning to walk as a toddler, learning to run as an Olympic track star, or learning to play the violin, we must develop the proper neuronet to house the desired talent. Some people have a little more natural talent than others, which is why we all learn at a different pace, but regardless who you are you're still going to have to pass through the learning-curve just like everyone else. The important thing is to make the firm decision to do it and stick with it to the end. The only thing left to do is put everything we've learned into practice! After all, if we don't answer the Hero's call to battle than we'll never have the adventure we long for. So how do we begin our descent into the underworld? How do we become immune to the sleep serpent’s venom? Well, first, we must go it alone. I mean, really, you can't even have a thought to keep you company. In Book One of the Subliminal Cognition Training series, I prefaced the 120-Days-Curriculum with the fundamental practice of Trance. Without first acquiring the skill of entering Trance, and sustaining it for at least thirty minutes, you don't stand a chance against the magic of the sleep serpent! Believe me, you'll lose every time. A famous mystic and poet once admonished, "Be thou athlete with the Eight Limbs of Yoga, for without it thou art not disciplined for any fight!". I couldn't have said it better myself! In my workshops, online and in-person, I'm often met with confused looks when I describe the secret key to entering the Trance state. The confusion stems from the paradoxical nature of Trance. To illustrate this ambiguity of the Trance state I find that the Zen practice called Zazen makes for a perfect example. The traditional instructions for Zazen are pretty darn simple. You're told to sit with your spine erect but relaxed, with your head gently suspended as though a string were softly pulling your head upward toward the sky, with your eyes either closed or else halfway open and staring softly forward and downward, either at the floor or the tip of your nose. A little later on you're to include a relaxed but focused attention on the natural rhythm of your breathing, but in the beginning, you’re told to just sit. Okay! I dare you to try it right now. Put this article down and find somewhere comfortable to sit. Now just sit there. Don't do or think of anything else for the next thirty minutes. Don't worry, I'll wait. Hey, you're back! So how did it go? If you're like me when I first tried this exercise twenty-two years ago then you couldn't even manage five minutes without getting lost in thought, internal dialogue, or physical restlessness. If this describes you don't dismay. Entering the state of Trance isn't an easy thing to do when you first try it. It can take months or years to master it. Personally, it took me roughly two years to become proficient at it and I still haven't exhausted my full capacity to deepen this most basic of psychic talents! The practice of Zazen has been aptly likened to two professional dancers. When you're watching a performance of, say, the Waltz, demonstrated by two skilled dancers, it's hard to tell who leads and who follows. In much the same way, when you're entering Trance it's hard to say what you did to enter it and what you didn't do to enter it. On the one hand you've made the conscious decision to sit in Zazen and enter the Trance state. That looks like a form of doing, and yet all you're really "doing" is sitting there and allowing everything to be exactly as it is in that moment! To say "Yes" to the Now without feeling the need to add or subtract anything from the moment is the fastest route to disengaging your present state of consciousness and enter sleep. In terms of bioelectrical brainwaves, if you're in BETA (awake/task-oriented) then anything you do while in that state will lock you into that state. In other words BETA, which is task and result oriented, is disempowered by the firm decision not to do anything. This psychic passivity quickly thrusts you into the ALPHA state (relaxed wakefulness). We're all familiar with this state and it has two modes, one productive and the other counterproductive to our quest. Whenever you're reading a book and suddenly realize that four pages have been flipped without you remembering anything you've read, you're in ALPHA. Conversely, you're also in ALPHA whenever you do remember what you've read. In other words, you're processing data without ruminating about it. In the first case you're on autopilot; in the second case you're relaxed but it's a curious relaxation. Because if it's curiosity it's very fertile, and as you've probably guessed it's this latter expression of ALPHA that we're aiming for in our practice of Trance. Just as you can passively but curiously watch your favorite sitcom on TV, you can sit and watch your breathing, emotions, and your thought-processes with the same detached but curious gaze. Follow this formula long enough and what happens is that you enter the THETA state of consciousness. This marks a pivotal turn-of-events, as the THETA state begins your true entry into the underworld of sleep! To successfully perform our descent into the dark underworld of sleep we're going to need a bright lantern. That lantern is our consciousness itself, and just as a lantern can't burn without fuel and without shelter from strong gusts of wind, neither can our awareness burn brightly and stably enough to illuminate the dark cave of DELTA sleep without adequate rest, diet, and adrenal strength. DELTA sleep is the dominant brainwave found in dreamless sleep, babies, and coma patients, so you can imagine how challenging it can be to maintain alertness here. In fact, the very sleep cycle itself can be likened to a vast ocean of DELTA, with tiny islets and streams of THETA and (more rarely) GAMMA waves here and there. DELTA sleep is largely the province of NREM sleep (non-rapid eye movement), and accounts for roughly 2/3rds of a sleep cycle. If allowed to complete a full night's rest (eight to twelve hours), then REM sleep can transform from a small stream to a large river, which makes it more probable that Lucid Dreaming can occur. It should be pointed out that conscious DELTA sleep (called Pellucid sleep) is synonymous with deep meditation and is precisely what we need to master if we wish to be successful in our Katabasis/Anabasis. Without sufficient training in Pellucid sleep and dreaming we don't stand a chance at falling asleep consciously. Of course, that doesn't mean that we can't still practice the "4:00am method" and enjoy Lucid Dreaming. We can! But our experience of it will be limited to the hypnopompic phase of sleep, when what we really want as Veiler's is to enjoy the full spectrum of Conscious Sleep, which includes the hypnagogic phase as well. Conjure up the conviction that everything you've ever wanted is yours and everything you could ever think of accomplishing has been achieved! You should notice a brief but sudden feeling of contentment. This can be deepened! More importantly, notice the work that this contentment does for you. Normally we're split into two parts, with one half of our psyche being the watcher or doer and the other being the experience being watched, the idea being thought, or the activity being done. In other words, we're always attempting to see ourselves from the outside, as it were, rather than just being what we are in the moment, and what this contentment does is it relaxes this tension and allows us for the moment to just be. That's why the fastest route to never learning how to successfully meditate is to sit there with eyes closed and repeatedly wonder to yourself, "Am I doing this right?" Rather, just be there with whatsoever arises and say "Yes" to it; and then wait! The moment you start to feel yourself nodding off, gently focus on your breathing. Don't do anything with the breathing rhythm just yet! Simply watch it as you would your favorite TV show. This will serve as an anchor for your alertness. Lastly, resist the urge to lay down and go to sleep. Don't give in to the venom of the sleep serpent! Simply sit there and know that by doing so you're slowly becoming immune to that venom. Before you retire to bed for the evening arrange your sleeping space so that it's free of distractions such as loud noises, bright lights, or activity of any kind. Next, you'll need a Memory Foam wedge or recliner of some kind that you can fall asleep on while reclining on your back at roughly a 45° angle. Lay down and relax for a few minutes and enter a light Trance state (ALPHA). Next, place the palms of your hands over your navel with your dominant hand on top of your non-dominant hand. Gently begin Fire Breathing by inhaling quickly through your nose and exhaling somewhat forcefully out of your mouth. Do thirty repetitions, gradually increasing the speed of hyperventilation as you go. Once you reach thirty breaths, exhale fully and hold the breath out for as long as you can. Then inhale fully and hold the breath for a slow count of fifteen and begin the process all over again. Repeat four times. You'll notice, after the second round, that you're able to exhale and hold the breath out for longer and longer periods of time. I've gone up to three minutes without the need for air! The reason for this is that you've flooded your body with oxygen during the hyperventilation phase, therefore your need to inhale is reduced. Every cell in your body holds on to the oxygen until the carbon dioxide builds up in your lungs as you hold your breath out. When you feel the need to inhale that's your body telling you that a sufficient quantity of carbon dioxide has built up. When you do so your cells, which have been holding on to the excess oxygen, relax and flood your body with oxygen rich blood. This is the breathing technique suggested by some physicians to prevent unconsciousness during a heart attack while one is alone. During a heart attack, you have about ten seconds before you lose consciousness. This breathing technique could keep you conscious long enough to get to a phone or an emergency room. Imagine what it could do for you as you're falling asleep at night and attempting to do so consciously! Once you've completed three rounds of fire breathing, relax and breathe naturally. Allow yourself to drift further and further into Trance (Conscious Sleep). You should notice an increase in hypnagogic imagery and a pleasant natural high (who needs drugs?). What you've essentially done is to balance the dominant Yin energy of night time with the Yang energy of the fire breathing. This process of adjusting the Yin/Yang balance of the body is known in Taoism as "Kan/Li" (water/fire). With it you effectively stimulate the adrenal glands of your body, which is a secret key of successful Conscious Sleep. Master it and you'll have gained a powerful antidote to the intoxicating venom of the sleep serpent.